Move your mouse over a map and you will see detailed flight information (Flight Number, Origin, Destination, Aircraft, Altitude, Heading, Speed, elapsed and remaining time).You will also see detailed airport and airspace information. Have you ever wondered whether it is possible to track in real time any flight over Europe, North America and other regions of the world? 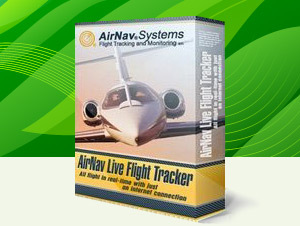 Welcome to the New Version of AirNav Live Flight Tracker, the first and only flight tracking application that integrates flight data from the FAA Radar Systems (ASDI) and AirNav Systems worldwide Mode-s/ADS-B network resulting in an average of 7000 flight being tracked worldwide. BRAKING NEWS: The best ft software got even better: easy, fast, reliable. New graphics and user interface. Track blocked flights. New flight data source information. Check aircraft registration. Optimized flight data processing routines. Auto detects your location. Automatic Airport Weather information. Auto save of all application settings. based on robust RadarBox software technology. Different colors for different flight stages. More frequent screen updates. Download a Free Trial Now (31 Mb) Install, run and click the Demo button. 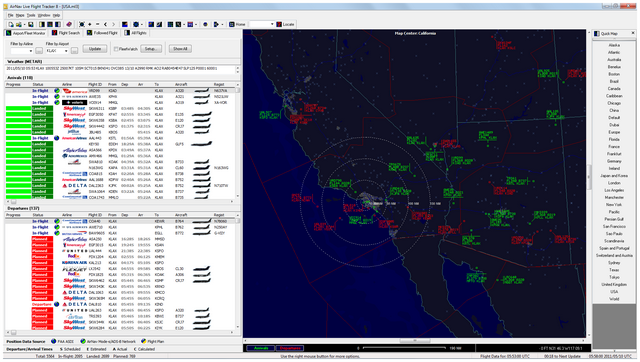 For the first time a flight tracking application integrates FAA and Mode-S / ADS-B data sources resulting in a Worldwide coverage.